No-bake desserts are some of our most popular recipes. 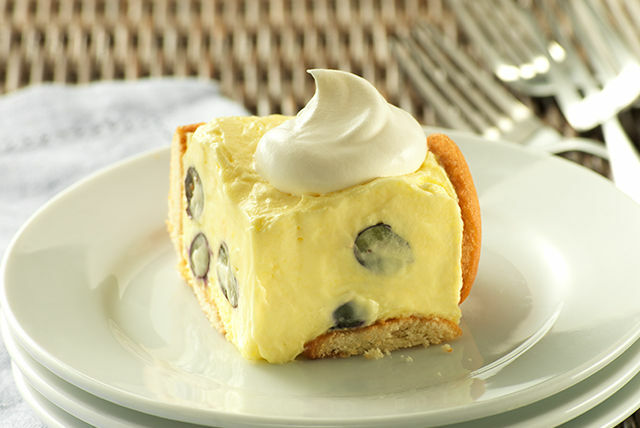 Here's another one to try - these Lemon-Blueberry Squares are quick, easy and oh-so-good! Line bottom and sides of 8-inch square dish with wafers. Beat cream cheese in large bowl with mixer until creamy. Gradually beat in milk. Add dry pudding mixes and lemon juice; mix well. Whisk in 2 cups Cool Whip and blueberries; spoon into prepared dish. Refrigerate 3 hours or until firm. Serve topped with remaining Cool Whip. Place completely unwrapped package of cream cheese in microwaveable bowl. Microwave on HIGH 15 sec. or just until softened. Add 15 sec. for each additional package of cream cheese.